If you’ve been paying attention to life here on planet earth for any length of time now, you’ve probably noticed that the American dollar is not the only game in town. As a matter of fact, it’s barely hanging on by the skin of it’s teeth as a decent world currency, thanks to out-of-control government printing and the relentless pressure of inflation. According to the State Department, there are several countries enjoying a local currency that is stronger than the dollar. It might be helpful to be aware of this trend. We’ve listed some below. Right now, the euro is kicking the dollar’s rear end from end zone to end zone, currently exchanging at .74 of a dollar. What this means is that it takes MORE dollars to buy something than it does a euro. The euro has about 25% more purchasing power. Where the boots hit the highway is the effect on international travelers. If you head for a European Union country from the United States, things are going to be a heck of a lot more expensive for you when you get there. But it’s not just the euro. Take a look at other countries’ currency and the relative value to the dollar. While it’s true that some countries make a cottage industry out of manipulating their home currency to look better abroad, the trend is still disturbing. Wondering which country stacks up worst against the dollar? 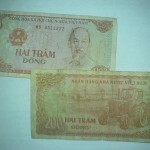 It’s the Vietnam dong at a conversion rate of 19,080 to $1.